264 pages | 1 B/W Illus. Several disturbing issues pose a threat to the marine environment and its wellbeing, among them marine environmental pollution and degradation of marine biodiversity. Most troubling is that these issues are overwhelmingly caused by human activities which are sometimes transboundary, and their consequences will become more severe and complicated if not properly curbed. Thus, these activities require comprehensive policies, laws, and principles to manage them effectively. Linked to these solutions is the need for responsibilities, cooperation and commitments at local, national, regional and international levels. Contemporary Marine Environmental Law and Policy presents a thorough appraisal of the main issues, actors and institutions engaged in the legal aspects of marine environmental conservation. 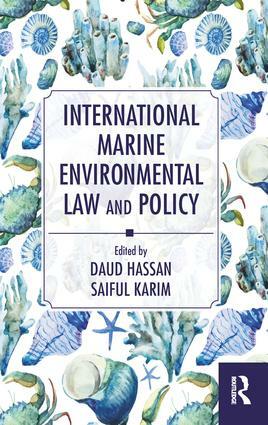 With contributions from an international range of authors, the book provides a concise account of the legal and policy framework underlying international marine environmental issues, and of the fundamental concepts and strategies that are important to the protection of the marine environment. Some of the topics explored include: the prevention of marine pollution caused by land based activities, ships, and offshore hydrocarbon and mineral resources exploration; the conservation and management of marine living resources; the marine environment in the polar regions; and the settlement of marine environmental disputes. This book provides a solid foundation for anyone studying International Environmental Law and the Law of the Sea. It will also appeal to anyone seeking to gain a deeper understanding of this hugely important subject. Daud Hassan is the Director of International Centre for Ocean Governance (ICOG), Western Sydney University, Australia. Md Saiful Karim is the Director International at the School of Law, Queensland University of Technology, Australia.